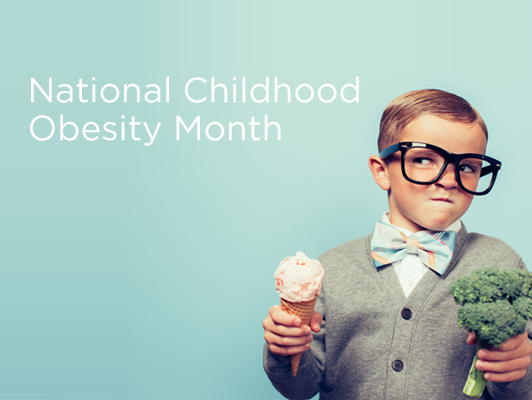 September is National Childhood Obesity Month. Its focus is on improving the health of our children, the next generation. According to the Centers for Disease Control and Prevention, about one of every five children, or about 17 percent, are faced with obesity. It’s a serious health concern for many reasons. Studies have shown that children who are obese have a higher risk of becoming an obese adult. Being obese as a child can lead to lifelong chronic conditions and complications like type 2 diabetes and increased risk of some cancers. Children with obesity-related issues also are at a higher risk of being singled out or bullied, which can have damaging effects throughout life. Talk to your doctor about your child’s risk factors. Talk to your child about the importance of making healthy choices like limiting screen time, eating fruits and vegetables, having reasonable portions, and being active. Involve your child in preparing and cooking healthy meals. Aim for 60 minutes of physical activity as a family each day. Rolemodel good behavior; after all, your children are always watching. Involve your child in choosing healthy meals and snacks for the entire family. Avoid depriving your child of their favorite foods or labeling any food as “bad.” Instead talk about the importance of balance and moderation. Remember to reinforce positive behaviors and talk to your child about the benefits such as the energy they have or how they feel. Avoid using the word diet, fat, or any other negative words surrounding this topic. Encourage your child to do things they enjoy as well as step out of their comfort zone and try new things. Encouraging our children to live a healthy lifestyle will pay off for years to come. What suggestions do you have for parents? Share your comments below.